Jad and William are a pair of officers on a world ruled by the Relay. The Relay is a large monolith in the center of the planet that laid down all the edicts that are the rule of law on the world. The Relay was brought by a man named Hank Donaldson, though nothing more is known about it. Answers will hopefully arrive when Donaldson’s world is discovered. Until then, Jad, William, and their peers keep the peace and spread the word of Donaldson on every world they colonize. Relay #1 sets up an interesting hard sci-fi premise that is primarily based around the effects of religion and colonizing. In the context of this comic, the two are almost inseparable, as the former informs the latter. 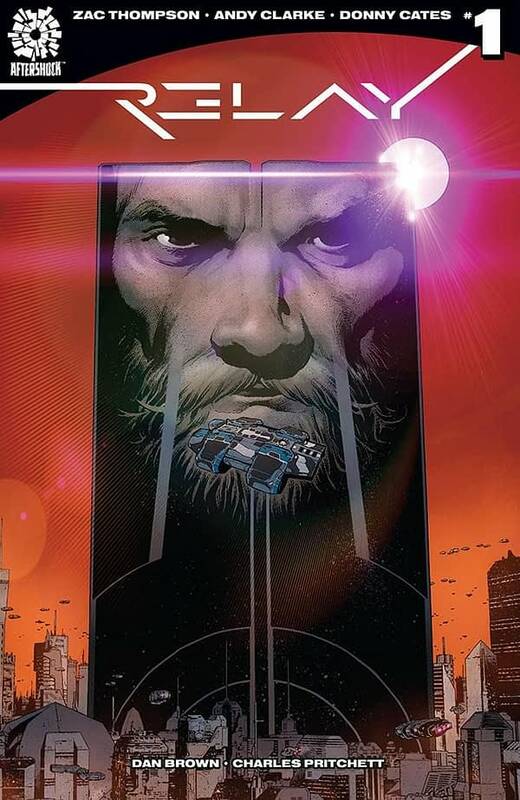 There are elements of consumerism, crime, and revolution in many cyberpunk comics. Relay isn’t quite cyberpunk, but it is within the same ballpark. What is especially interesting about the setup is that Jad, the main protagonist, is a Donaldson zealot and surrounded by skeptics. Often, a story like this would construct this as the reverse, and I’m interested in seeing the conventions changed and how that may affect this story. Andy Clarke’s artwork is heavily detailed and sets up a grounded and enthralling world throughout the book. The style looks great, and the depth of field is quite impressive. The visual design is interesting, and the expressions of the characters are effective. Dan Brown handles the color work here, but the review copy I read only had the first two pages colored. The colored pages I saw looked great though. Relay #1 is an interesting and fresh sci-fi comic with plenty of unique ideas that could set up for a great series. The protagonist is especially intriguing, and Andy Clarke’s artwork is great. This one earns a recommendation. Give it a read when it comes out on July 11th.